Important Announcement: If you have been looking for 1/2 inch FRENCH GIMP & SCROLL GIMP previously produced by Conso, D’KEI is NOW OFFERING a re-make of the 1/2 inch FRENCH GIMP & SCROLL GIMP in ALL COLORS! Call Customer Service at 800-535-3534 with questions. D’Kei wholesale trims has established itself as one of the leading providers of trimmings, tassels, upholstery nailheads and decorative home accessories in the United States. As a designer, importer and marketer of decorative trims we have become known as the company to count on for fashion forward design, great service and readily available products. We are the wholesale trim company boasting one of the broadest selection of styles, colors and textures of well-priced trim available including: nailheads, jeweled nailheads, bullion, tassels, curtain tiebacks, tassel fringe, wood fringe, leather fringe, beaded trim, rosettes, buttons, ribbons, brush fringe, cording, welt, tapes, gimps, jacquards, crystal fringe, drapery hardware, pillow forms and furniture legs. 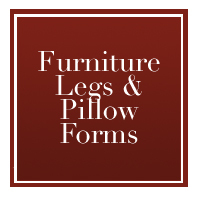 New product introductions and design ideas are driven by our experienced design team as well as through customer input. The largest customer segment that D’Kei serves is the professionally accredited Interior Designer. This demanding customer segment ensures that we remain current with colors, trends and styles. Whether it is feather trim, upholstery tacks or large tiebacks, designer trim is what you will find at D’Kei. Customers come to us when looking for Showhouse Trims and need dramatic drapery hardware and trim accents to set their project apart. Don’t forget the unique graphics pillows and designer lamps, including tassel lamps exclusively offered by D’Kei. No customer issue is too small and every issue receives our attention. We understand that dedication to service is what separates us from our competitors. 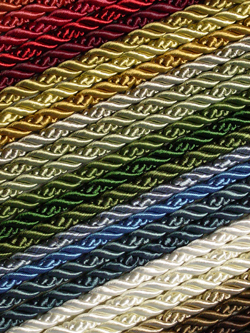 We manufacture our trims in many different countries to ensure the line is unique and offers many different choices of style, color and texture to meet the design requirements of any project. 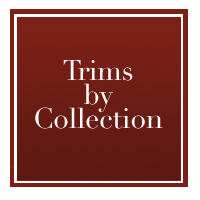 We are known for an extensive in-house sampling department, where we present our trims in a professional manner. Great care and attention to detail is given to present the trims in beautiful sample boards that designers, showrooms, distributors and manufacturers will be proud to display. D’Kei provides sample cuttings or memos at the customer’s request as well. Custom sampling requests are available.